It's my mom's birthday today and we're having a family dinner tonight at my place. Love you Mom!! Hope you are having a wonderful day and looking forward to spending the evening with you! I have made her something for her birthday and will share it with the next post, because I know that she'll be reading this and I want it to be a surprise! On to the card. I wanted to focus on making a card with my new stamps sets that I got from Rubbernecker (Kittie Kits). I decided to make a winter scene and will enter it for the "Craft a Scene" challenge for February ... check out this challenge blog here. I've never done this type of link because it's not possible on my website ... so I am starting up a blog and will be posting today's card on both. I had a lot of fun making the main image for this card. My new stamps are fun to work with and I love the way the brayered sky turned out. The tough part was figuring out a backdrop for the main image. After trying several different ideas, I decided on a forest of trees that are hand-stamped onto Whisper White cardstock using the Large Pine Tree stamp from Stampscapes (their stamps are awesome!). Hope you like. I inked the cabin stamp with Stampin' Write markers and stamped onto my Whisper White card front. I then stamped all the different sized trees by inking the stamps with Old Olive ink and then adding random swipes of Always Artichoke on top using a Stampin' Write marker. I masked the cabin and tree with post-it notes and brayered the sky ... first with Baja Breeze, then with Sahara Sand (I wanted it to have a bit more gray in the sky so it appears to be a cold day) and lastly with Not Quite Navy. I removed the two masks and then used the tree mask a second time to mask the tree at the bottom right corner. I used my Stamp-a-ma-jig for positioning, and stamped the fence posts in Soft Suede ink across my card front. With masking the tree, it appears the fence is in-behind the tree. I removed the mask. I mixed some Dreamweaver Embossing Paste with Whisper White re-inker (to thin out the paste) and added it (snow) to the main image using a small paint brush. I took a damp toothbrush and "smushed" it into another pool of Whisper White re-inker. I ran my thumb across the wet bristles and sprayed white paint all over the main image so it looks like it's snowing. I mounted the main image onto a frame of Not Quite Navy cardstock. For the background I inked the Large Pine Tree with Old Olive ink, added random swipes of Always Artichoke on top (Stampin' Write marker) and stamped onto the Whisper White cardstock, I stamped again (without re-inking) and litter higher and off to one side from the first stamping (second generation stamping). I repeated the inking, stamping, stamping across the page until it was full. I mounted the background paper onto a card base of Not Quite Navy cardstock. I mounted the main image onto the card front, popping it up with dimensionals to add depth. Gorgeous Loll! 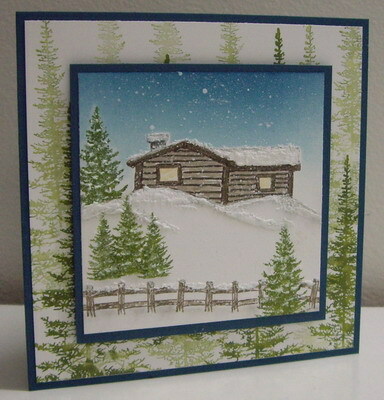 Love your snow scene and especially like the background you created using the Pine stamp. Mine never comes out looking as good as yours! Great job using the brayer for the sky along with the snow! p.s. Congrats on your new blog! Loll, this is a gorgeous scene. I love all the elements of the card but my favorite is how you splattered the ink to create the falling snow. I loved reading the description of the steps you to make your project. The evergreen tree background is so perfect with the scene and I am going to have to go and get that tree at Stampscapes. Thanks for playing in the Craft a Scene challenge and thanks for purchasing the Kittie Kits. I sure hope you will enjoy them. Gorgeous scene. The trees make a wonderful background and the cabin is so cozy, I just want to curl up by the fireplace and watch the snow come down. I had been wondering why I could never comment (I thought it was my computer) and didn't realize it was a website not a blog until just recently. Beautiful scene. I love the pine trees in the back ground. Makes you want to get a cup of hot chocolate and watch the snow fall outside.